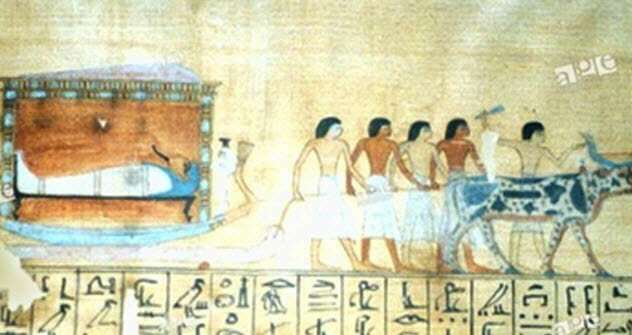 Hearses have been around for a long time in various shapes and forms. At first, they were rudimentary structures—from stretchers that transported the dead to their final resting places to the shields that carried the lifeless bodies of ancient Spartan warriors after they fell in battle. Over time, the construction of these makeshift objects has evolved into an elaborate, competitive industry in which automobile makers and funeral homes duke it out for the privilege of handling one of our most sacred moments: our deaths. What began as the simple necessity of transporting a body to a burial site became an elaborate ritual in which the living say goodbye to a dead friend or family member through a funeral procession. Did you know that the original hearses didn’t even transport the dead? They were just candelabras that sat atop other funeral devices for decoration. From ancient times to modern technology, here are 10 pivotal moments in the history of the hearse. Mentioned as far back as the Christian Holy Bible, the bier was a forerunner to the modern hearse. According to Scripture, a bier was a device upon which a corpse was laid after being made presentable for the loved ones. They would say their final goodbyes before burial. Then the bier was used to transport the dead body from the home to the grave, much like the modern hearse. A bier was a flattened wooden object that resembled an ambulance stretcher, sometimes with wheels on the bottom. 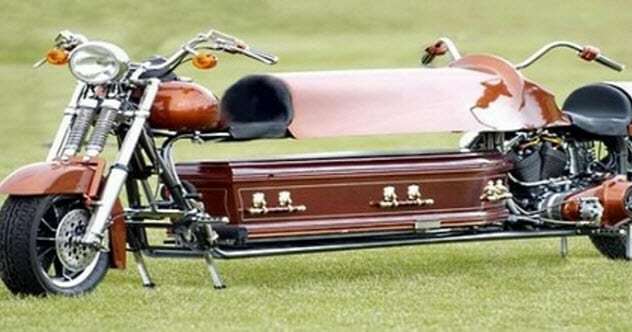 Its primary function was to easily transport the dead to their final resting places. For thousands of years, biers have served as the instruments of proper burials, especially in religious settings for monks, priests, and other spiritual figures. The origins of the hearse are a bit murky, but the practice of honoring the deceased in public has been with us for a long time. 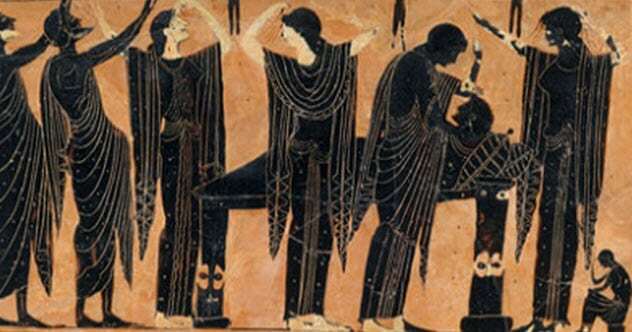 For example, ancient Greece had highly ritualized funeral rites in which coffins were simply carried by hand through the streets in a funeral procession. Absolute silence was demanded by custom. Coins were placed in or on the hands, mouth, or eyes of the corpse to pay the toll into the underworld of Hades. The body was also left out for several days to make sure that the person was truly dead. The ekphora was the name of the ancient Greek version of a funeral procession. The body was carried through the city and made several stops, where the women would lament and the men would remain detached and stoic. The body was toted in its coffin to various locations until it ended up at its final resting place. Until the 1600s, just about all funeral rites were carried out with coffins, biers, or other variations like the Spartan shield. After that, biers became more intricate and high-tech over time. The fusion of the tomb and the bier produced the horse-drawn carriage hearse. 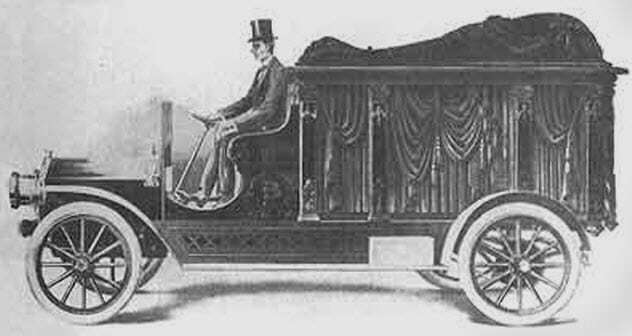 Until this moment in history, the term “hearse” was used to describe a candelabra placed atop a casket or funeral transport device. It was not used to describe the object that served as the means of transport quite yet. That was still called a bier. Even after the name shifted in the 1600s, the hearse was still a basic instrument, a flatbed where a coffin would be laid on top. This time, however, it was drawn by horses rather than having human beings push it on wheels or carry it to the grave site. In the early 19th century, some major shifts in design ushered in what more closely resembled the hearses of today—boxy, large structures where caskets would be placed inside. Throughout the earlier part of the 1800s, the structures enveloped the coffins and the bodies inside. There were also highly technical carvings and decorations as well as the occasional use of lanterns for lighting. 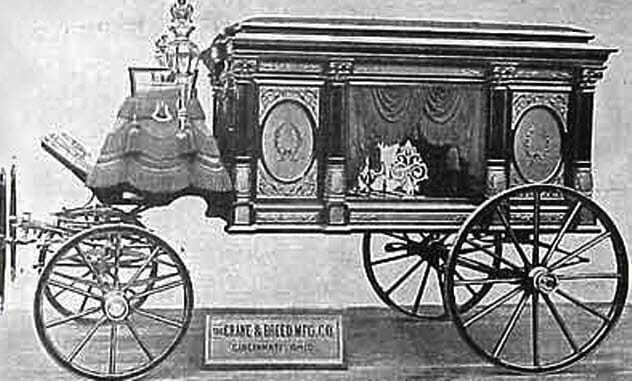 The company Crane & Breed began to manufacture highly decorative metal caskets to go with these more elaborate, horse-drawn, funeral coaches. Funerals were becoming a much richer art form and a much bigger business again. In the Middle Ages, people were often strewn into mass graves because the living were fearful of catching the plague. After that era, human society was finally able to pay its respects and mourn the dead again. The Black Death years were a particularly dark time for the funeral business, which was almost completely shut down because nobody wanted to catch this disease during its lengthy reign of terror and death. 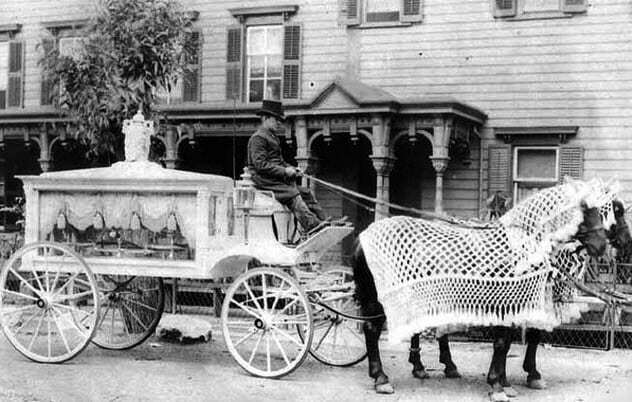 The 1880s saw explosive growth in both the design and functionality of the hearse. Many companies jumped aboard with highly decorative coaches, some of which resembled the Wells Fargo Bank coaches that carried US currency as America expanded westward. Others were more like the coaches of the early 1900s. In the 1880s, we saw windows, decorations, poles, much more metal use, and a total transformation of the funeral coach. At that time, the ultra-popular Rockfalls Hearse was created in Sterling, Illinois. It was later picked up and spread about by a successful businessman named Samuel D. Aultman. He was the founder of the Ferguson Funeral Home, which still stands today in Scottsdale, Arizona. It is one of the few funeral homes still around from the days of the horse-drawn hearse. It even has a museum of many of these old funeral coaches on-site. 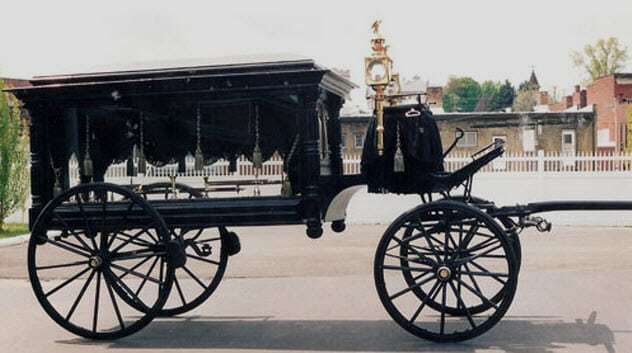 In England, the horse-drawn hearse was a staple of Victorian life and honoring the dead. For socially powerful people, this type of hearse would proceed through streets that were blocked off as in modern-day parades. Hundreds of people would follow the horses as they carried the body to the grave site, which is reminiscent of the ancient Greeks. 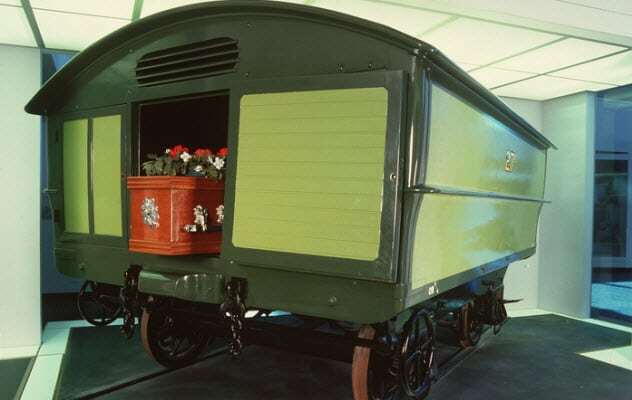 An unusual outgrowth of all this innovation was the invention of the tram hearse, which came about in the late 1800s. It was basically a hearse on rails. A tram or trolley car was used like a modern-day hearse to transport bodies via railway. These can be found all over the world as rail was the most popular mode of travel for a long time during the industrial revolution. From the heartland of America to Britain and Australia, the world over had hearse trolleys even though few people have heard of them today. The obvious downside was that a rail had to be built to transport the bodies to the cemetery, which was usually on the outskirts of town. 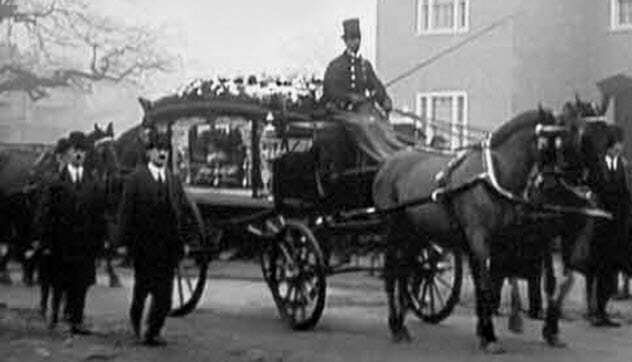 In Victorian England, the British were obsessed with death and dying as well as funeral rites, which included the hearse. This stems from Queen Victoria, who entered a long period of mourning after the death of Prince Albert in 1861. The small streets of London were crowded with hearses honoring the dead as the Victorian English took death very seriously. Even poor people made sure that they gave proper burials to their dead loves ones. The title of carriage-master, a company charged with maintaining coaches and horses, came about during this era. These companies leased hearses to funeral parlors as needed because the upkeep of horses was time-consuming and expensive. On May 1, 1908, the world of funeral processions was about to enter the modern age with the first motorized hearse from General Vehicle Company. It was powered by electricity. A year later, Crane & Breed released the first gasoline-powered hearse. As a result, funerals were now powered by fossil fuels. The world was modernizing fast, and the hearse was evolving to suit the needs of the technological society in the Western world. 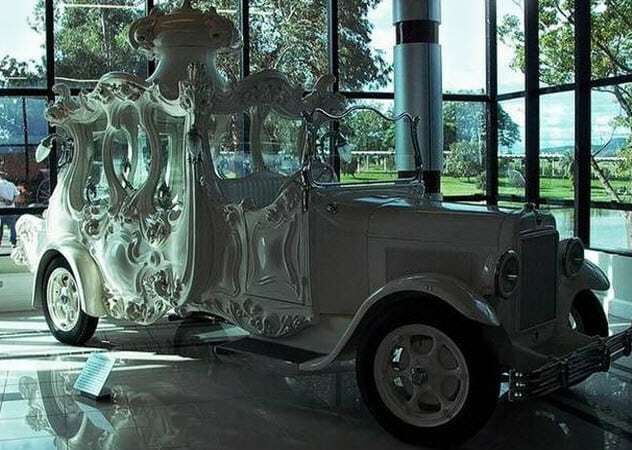 The early 20th century saw a boom in design changes for hearses—running the gamut of colors with large, elaborate designs that were not unlike those you might find on the ruins of the Titanic. From crazy waves to the classic 1930s design that was popularized as the Ghostbusters’ car in the cartoon Ghostbusters, hearses went through a number of wacky, wild makeovers. The Ghostbusters’ car was called the Landau hearse. In the cartoon, it was just an altered ambulance. However, it should be noted that the Landau hearse often doubled as an ambulance and a hearse. In the 1980s, the Ghostbusters movie was released. It featured the 1959 Cadillac Miller-Meteor Ambulance (which also doubled as a hearse). Iconic in movie and car history, that combo is possibly the coolest hearse to ever exist. Some of these models almost look like something out of a Disney cartoon, with large, cumbersome designs sculpted into the steel of the automobile. Some hearses were partially made of wood—at least the frame—and had statues carved into them, like gargoyles that overlooked the corpse and casket as they were transported to the grave site. The modern hearse can be seen as a luxurious, fully featured automobile almost everywhere in the First World. As with every growing industry, funeral cars are run until the newer models come out. Then funeral homes update their models, selling off the old cars at a great price. This has led to a world of customization and a niche audience of private hearse collectors. Some people have made hearses into motorcycles and even party wagons so that they can tailgate in support of their favorite sports teams. Others have also transformed hearses into lowriders with sleek styles, shiny paint jobs, and expensive rims. The customization has become endless. The average cost of a brand-new modern hearse is around $80,000. The hearse has grown up from basic stretchers and biers to become a full-fledged industry of caring for and paying respects to the dead, complete with air conditioning and antilock brakes. It even spawned several subcultures, from Gothic car clubs to lowrider events. There, you’ll find hearses decked out with spokes, loud speaker systems, and hydraulic lifts. In the past few thousand years, the way we honor and mourn our dead has progressed by leaps and bounds. Now we’re going to start seeing more interesting means of transporting the deceased to their final resting places, like the advent of launching the dead into space. Spaceship hearses, anyone? For more weird facts about death, check out 10 Fascinating Death Facts from the Victorian Era and 10 Terrible Things People Can Do To Your Body After You Die.